Corboy & Demetrio is pleased to announce that the recipient of the 2018 Thomas A. Demetrio Award of Excellence is Chicago-Lawndale AMACHI Mentoring Program, which provides tutoring and mentoring services to children in North Lawndale. The AMACHI program was founded by Dr. Betty J. Allen-Green who started it in 2007 to serve youth whose parent or immediate family member was incarcerated but later expanded the organization’s mission to include all youth in North Lawndale. Dr. Green worked for Chicago Public Schools for 35 years, serving as principal of Herzl Elementary School for 18 of those years. The Award was presented to AMACHI at the 2018 Lawyers Lend-A-Hand Annual Spring Awards Dinner. 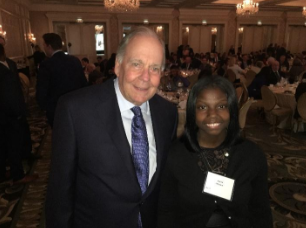 Named in honor of Thomas Demetrio, President and Co-founder of Corboy & Demetrio, and funded by him, the award is given annually to tutoring and mentoring programs that impact the lives of underprivileged youth. In 1992, the Lend-A-Hand Award of Excellence was created by Thomas A. Demetrio while he was President of the Chicago Bar Association(CBA), with a desire to impact the lives of Chicago’s underprivileged children by recognizing the efforts of exceptional tutor/mentor programs in the Chicago communities. From this Award was born the Lend-A-Hand Program. The Chicago Bar Foundation(CBF), with the leadership of the CBA, initiated the Lend-A-Hand Program in 1995, and it has continued to evolve ever since. The CBA and CBF created the Lend-A-Hand program in dedication to the lasting memory and generosity of Tom’s mentor, the Honorable Araham Lincoln Marovitz. In addition, to the Demetrio Award, the LAH has given gifts of more than $1.6 million to worthy mentoring programs. Thomas Demetrio is a Life Fellow of the Chicago Bar Foundation and has served on the Lend-A-Hand Advisory Board since 1994.